With Formnext 2018 coming up next week, companies are making their latest technologies known. In keeping with this, EOS has just showed their hand with their newest LaserProFusion system and much more. 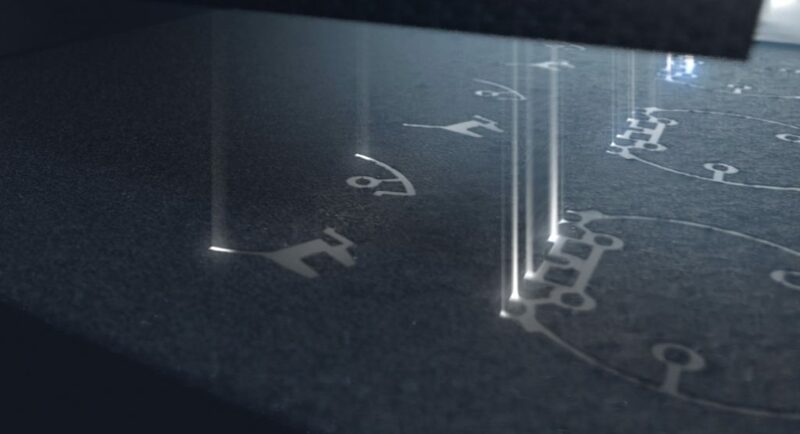 The one million diode laser system can print at 10 times the rate of existing systems. The company states that the laser printing system has the capability to replace injection molding for certain functions. There is little data available about the new printer but we do know that printer uses a powder system. It also works exclusively on polymers and, as the picture below shows, the diodes work from the bed upwards. Along with their LaserProFusion system, the company has also unveiled it’s other plans. On 14 November, at 12.30 pm, Dr Angelo Grubisic will be demonstrating the Daedalus Mark 1, a jet suit partially made of metal and polymer components produced using EOS 3D printing technology. EOS will be also showing its EOS M 300-4 3D printing machine, reportedly the first system of the new M 300 series of metal printers. M 300-4 will serve as a metal system and a production cell. The company is also looking to introduce their new Technology Readiness Level (TRL) certification. The certification was originally a NASA invention with the purpose of determining the maturity of devices and materials throughout the development process. Each level of the TRL scale corresponds to the items readiness in terms of data available. For example, level 5 refers to a verification of the technical solution. Similarly, level 9, the highest level, refers to full production capability documented with extensive statistical data. TRL 3 -6 will refers CORE products, like early-stage copper materials, while TRL 7 -9 applies for premium products suitable for use in serial manufacturing. These new plans all form a picture of EOS as heading towards industrial scale, competing with major manufacturing systems.